This blog is the tenth part in the series “Demystifying Mindfulness.” I’m hoping I can help us all understand a little bit more about the practice of mindfulness, how it can be helpful and how we can integrate it into our lives. This week we welcome guest blogger, Fern Nibauer-Cohen. 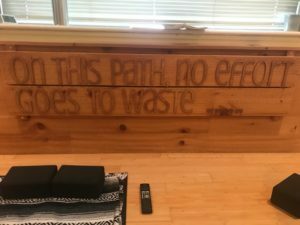 I have been practicing yoga at the same local studio for several years and during each class, this saying from the ancient Hindu text, the Bhagavad Gita stares me in the face: “On this Path, No Effort Goes to Waste.” This can be applied into all aspects of life, especially when it comes to a mindfulness practice, a yoga practice, an exercise routine. Full disclosure: I am my worst enemy. During my yoga practice, my inner chatter tends to focus on all of the things I am not vs. the fact that I have made the effort to show up on a Sunday morning to move mindfully. Going down that path creates a feeling of worthlessness, negativity and completely cancels out any positive effects of the practice that day. After staring at this statement for years, it finally dawned on me that just showing up is progress. And sometimes that’s all you need to do. “Showing up” comes in a number of forms. It can be as simple as dedicating a few minutes to close your eyes and take some deep breaths with your feet grounded on the floor beneath you. As the popularity of ancient practices such as yoga and meditation/mindfulness continues to evolve, we are under the false impression that we have to adhere to a rigid and prescribed routine. This sets us up for failure within our own minds, which then escalates into negative self talk. This is not the art of mindfulness. Lately, I have given myself permission to take a step back to observe and acknowledge the literal “small steps” I make each day toward my goal of having a regular mindfulness practice. Just at the moment when I beat myself up with the “not good enough” conversation, I become aware of the accomplishments I have made toward my goal and this immediately settles my mind and allows me to become much more open to cultivating more of what I want in my life. BREATHE: Anywhere, anytime you can reset your mind by taking several deep and audible breaths. MOVE: If you are able to take a break and stretch as you are inhaling in and out, even better! Movement linked to breath is yoga, so… you’re doing it. You can do this in a chair, in a bed. You don’t have to be upright. GET AN APP:There are many apps available to guide you through meditation practices. I like Headspace because their graphics are soothing. Fern Nibauer-Cohen is the director of Patient Engagement and Business Development for Penn Radiation Oncology. She is passionate about bringing Quality of Life and Integrative Oncology programs into the hospital setting and is currently working with a clinical team to conduct ongoing research on the value and benefits of Quality of Life Programs in oncology. This entry was posted in Christina's Resource Round-up!, Homepage, OncoLink News and tagged mindfulness, yoga. Bookmark the permalink.